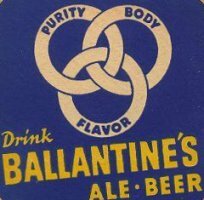 The name of Borromean rings comes from a famous family of Italian princes from the Renaissance era, the Borromeans, who adopted the rings as their heraldic symbol. They were carved into the stones of their castles, on one of the Borromean Islands in the Lago Maggiore (Isola Bella), in northern Italy. This link can also be found on carved stones from around the 9th century, on Gotland, an island in the Baltic Sea off the south-eastern coast of Sweden. It is believed that they correspond to legends derived from Norse mythology. Besides, peoples from northern Scandinavia call a representation of the Borromean rings "Odin's triangle", or Valknut, "knot of the killed one". The symbol was also carved into the frame of beds used during funerals at sea. Left-handed link: each ring is above the following one if we turn counter-clockwise, hence they "go down". Right-handed link: each ring is below the following one if we turn counter-clockwise, hence they "go up". 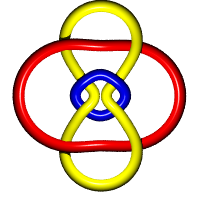 Borromean rings form a link composed of three unknots linked as shown above: these two representation, mirror images of one another, seem different, but in fact give topologically equivalent links (go from one to the other by pushing two of the rings into the third one). 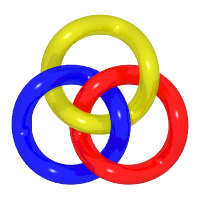 The 3 rings are free (red above yellow and blue, yellow above blue); unlink. 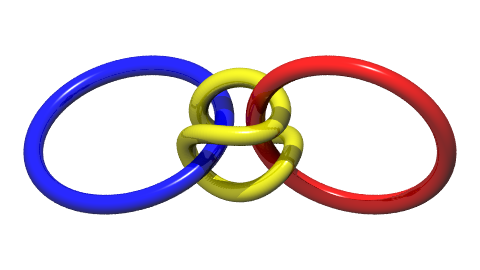 Only one pair of rings is linked: the yellow one (between the red one and the blue one) is in fact free (pull it in the north-east direction)! 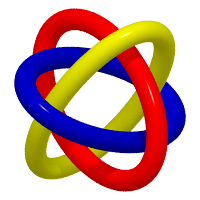 Two pairs of rings are linked (red-blue and red-yellow): we get a Hopf link with 3 rings. The three rings are pairwise linked: we get the prime link . 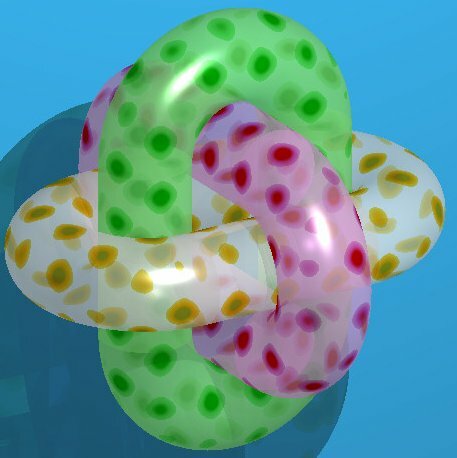 In the case of the "real" Borromean links, no pair of rings intermingle; it suffices to cut one of the rings for the structure to fall apart: the underlying general notion is that of Brunnian link. 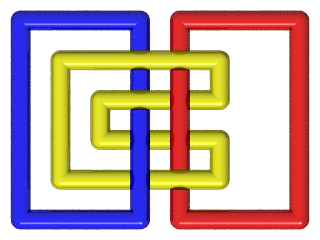 The Borromean rings form the Brunnian link with the minimal number of crossings. 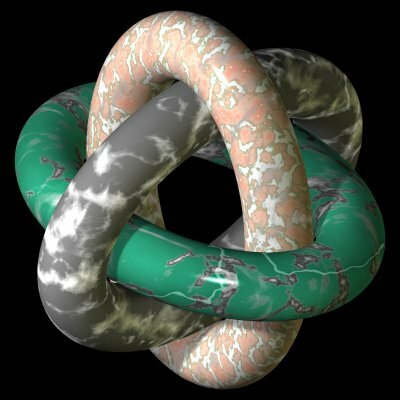 Here are 3 topologically equivalent representations of the Borromean rings (try to mentally go from one image to the other!). The representation in the middle is composed of three ellipses located in planes that are pairwise orthogonal. Notice that the yellow loop encircles the red one, which in turn encircles the blue one, which in turn encircles the yellow one, etc. From this we derive the "planar" projection on the right: it has 8 crossings instead of 6, but with non-alternating passages. Next steps of the deformation. 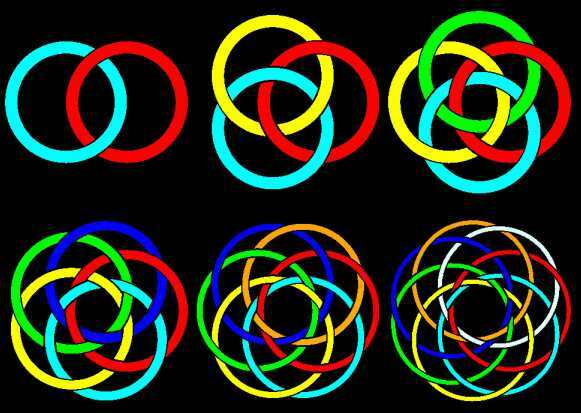 They are still Borromean rings! 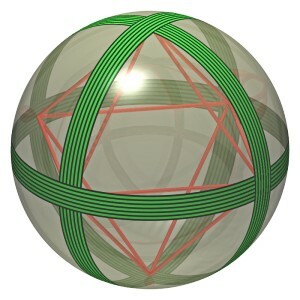 The projection on the circumscribed sphere of the edges of an octahedron gives three circles which, if linked with alternating up-and-down passages, provide the above 3D representation. 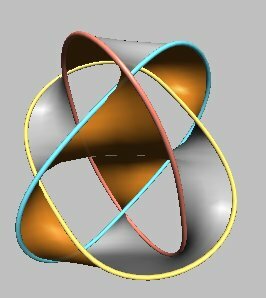 The fact, which seems obvious, that the configuration of the Borromean rings cannot be achieved thanks to circles without them meeting and without deforming them, is yet very difficult to prove (see Aigner, Ziegler, Proofs from the book, 5th edition, pp. 95 to 102). 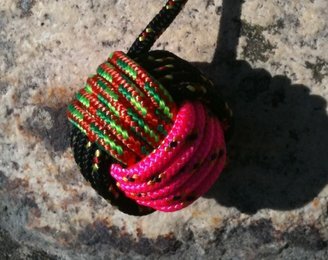 In seamanship, the monkey's fist, consists in multiple Borromean rings (considering that the 4 quintuple rings are composed of closed rings). Notice that each color encircles another one! See a construction on the excellent website nico-matelotage. On the left, a view of Borromean rings located in three orthogonal planes, made by Alain Esculier. ; the diameter of the rings is b-a, condition for them to be tangent; the condition under which, at the tangency points, the sections by the coordinate planes have the same curvature radius is where is the golden ratio; it is remarkable that, if in this case, the 3 circumscribed rectangles of the ellipses are the rectangles used to construct the regular icosahedron (look at the image on the right). 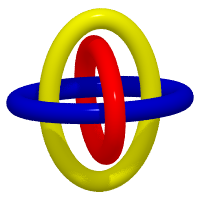 Different views with rings that are pairwise orthogonal, made by Alain Esculier. See this sculpture by Tony Smith. Generalization to n circular rings the centers of which are located at the vertices of a regular polygon; intertwined in alternating up and down passages. Note that when n is odd, no pair of rings is linked, as in the case of Borromean rings, and that 3 consecutive rings form a Borromean link: since they are not linked pairwise, this link is not Brunnian for n > 3. 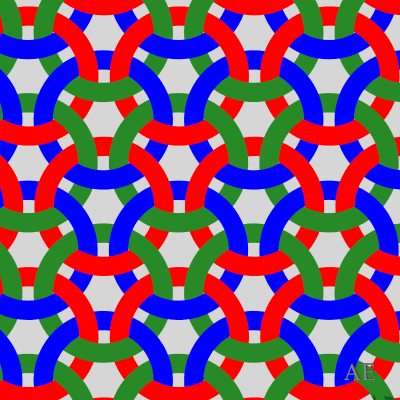 When n is even, the link is, in a way, "anti-Borromean": each ring is tied to another one. Images made by Alain Esculier using Povray. 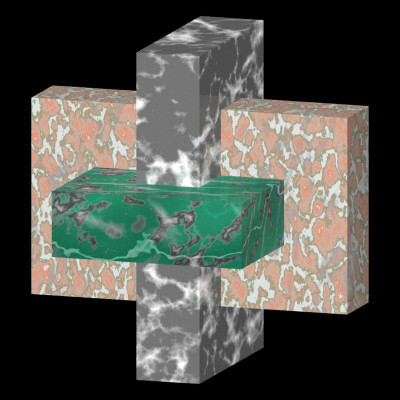 See also the Seifert surface associated to the Borromean rings. 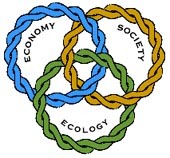 Borromean rings are a strong symbol of the necessary cohesion in a group: companies use them as their logo, universities show them off at the entry of their campuses, and it is one of the elements of Lacan's Symbolic. 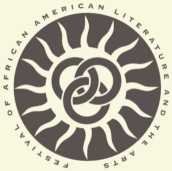 American festival of literature: the 3 rings are linked pairwise. 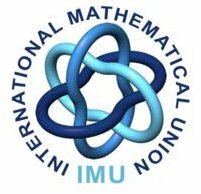 International mathematical union: left-handed pairwise orthogonal rings. See below that the rings found in the Borromeans' property are not Borromean rings! The heraldic symbol of the Borromean family. 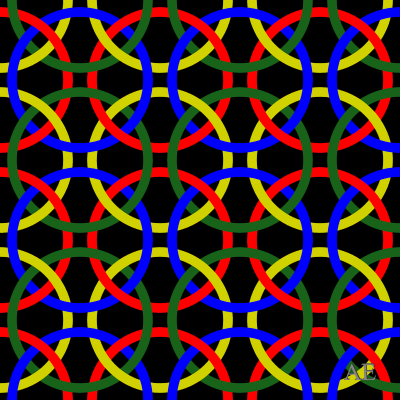 These are not real Borromean rings: the ring at the top, on the left, is free. 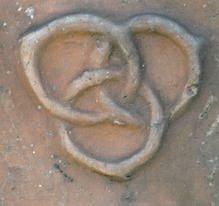 Symbol carved on a flowerpot; not really Borromean rings either: the two topmost rings are linked, the third one is free. 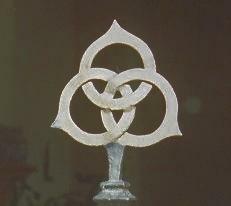 Symbol on a garden gate; not really Borromean rings either: the rings are pairwise linked. 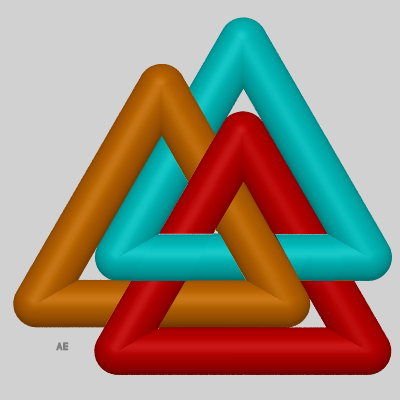 Penrose triangles linked as Borromean rings. Creation of Francis Casiro, inspired by Oscar Reutersvärd. Variation, creation of Alain Esculier. the tessellation obtained is equivalent to the Diana tessellation. 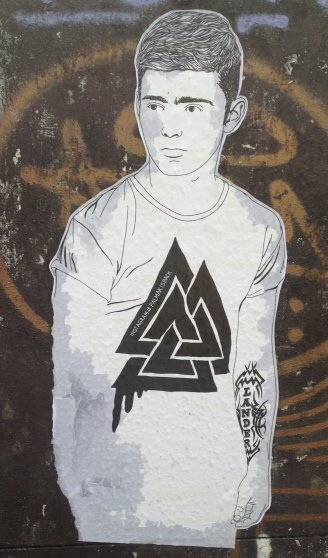 Collage by Julien Garnier, Odin's Valknut.